I hope you enjoyed my many face collage above, I couldn't resist not putting it as my cover picture for this post. Just wanted to show the goofy side of me since I haven't done that in a while. Of course, I always make it a point to take 10, 000 pictures after getting a hair makeover. I'm a beauty blogger, that's what I do. Lols. 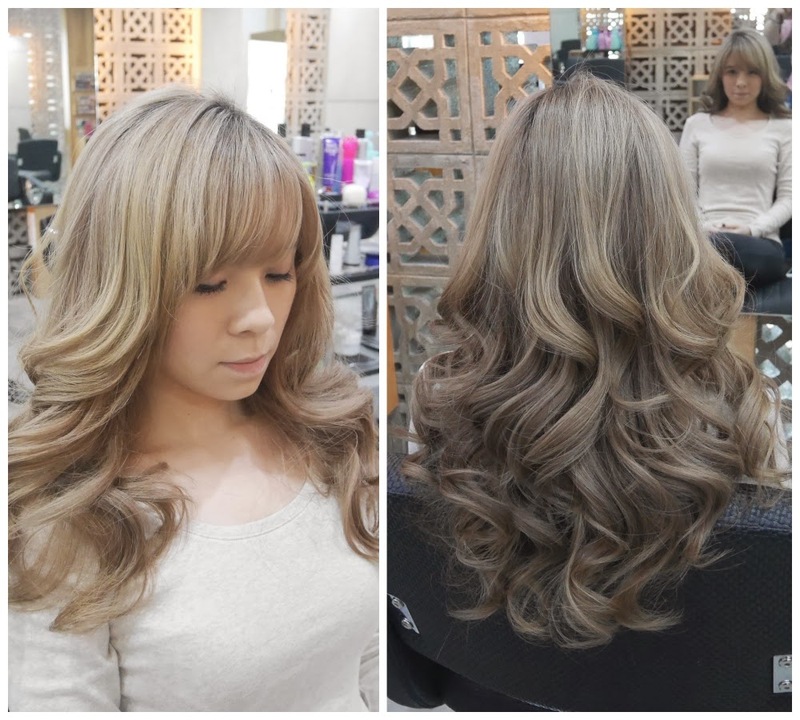 Anyway, I visited Frank Salon for the second time mainly to get a hair treatment. As you all might know, since my last hairdo, I bleached my hair twice. Thus, pampering my hair with a professional salon treatment is justifiable. Plus, since everyone commented how pretty this faded hair colour is, I decided to keep the colour until I'm bored with it. Read about my Hair Bleaching and Colouring experience at Frank Salon here. Btw, thank you for all your kind compliments on my hair on social media (Instagram, FB and Twitter), I truly do love them very much too! Frank Salon uses mostly Japanese products and for my hair treatment, they used a brand call Deesse's that's great for coloured hair like mine. Shampoo - Amino oil - Moisture veil - 5 minutes rest - rinse - Smoothing collagen - steam for 10 minutes - rinse and blow dry. I love, love, LOVE shampooing here. They give the best head and neck massage in the world! I'm seriously not kidding. If you feel like you just need a place to de-stress after a long day at work and going to a spa is just too much, come here and try their Wash and Blow. Your head will feel 10 pounds lighter I kid you not. They used a colour shampoo for me but I believe they would use other shampoo if you hair is not coloured. It comes with a citrus fruity scent of orange and grapefruit and its purposes is to smoothen out the bumps on the surface of the hair. This comes with a juicy citrus scent of lemon and lime with the purpose of bonding with the amino oil to enhance moisture retention of the hair. This has a floral fragrance of rose and jasmine with a sole purpose of providing a smooth top coat over the moisture veil, giving hair further protection and care. Look ma, steam is coming from my hair! After a fun time pampering my blonde wannabe hair, they did a little trimming by giving me more layer and fringe. Finishing it off with a big bang since I told them I had an event after that. Oh yeah, check out my temporary curls. Aren't they beautiful?! They are so soft and bouncy, literally bounces on every step that I take. I wish I can wake every morning and immediately look like this. D: So if you are looking for a place for a temporary hair makeover for an event or one night function, you can see they have skills. What do you think of my makeover? I'm thinking of having permanent curls next round, should I? For more information, visit Frank Salon Facebook page or call 03-22423109. 7 Jalan Kerinchi, 59200 KL, Malaysia. *Hairdo was free but opinion remains my own. This is my experience at Frank Salon. A Great Night With Somersby And Friends!